Due north of the Theocracy lie the mountainous, glaciated lands of the Northmen which drop into fjords which lead into the Eismeer in the West and the Rime Sea in the East. Historically the Northmen have not practised the faith in an organised fashion and they have different names for the gods of the Assembly, many whisper rumours of demon worship but these are surely just propaganda. The Theocracy has had difficulties bringing the faith north and the main communication has been coastal raiding by Fjordsmen and land raids across the border. With the cataclysm, this has changed significantly as the north has been presented with a necessity to join in alliance with old enemies to ensure their survival. As the Northmen have come into conflict with the Undead troops across the ice and the northern Rime Sea, great battles have been reported between the savage Fjordsmen and the silent bone ships of the Lich King’s fleet. 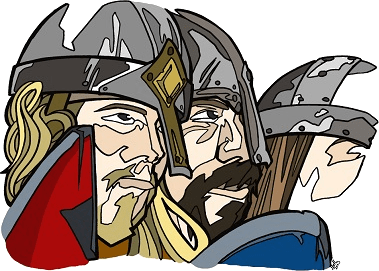 Below you can find information on the major settlements within those frozen wastes, but the Northlands Culture and the Gods of the North are very different to their Kingdom of Elland and Theocracy neighbours. Originally a port at the base of a silver rich hill, but now known as “silver” due to all the plundered treasure that before the truce made its way through the port from raids upon the southerners. At the edge of the merciless tundra and the Grey Forest, lies Dystermark, the most northerly city known to the living. A wild, evergreen forest beside the tundra that stretches for miles into the extreme North. Home to ghost bear, storm boar and tundra wolf, the Grey Forest is home to only a few of the most fierce and savage clans, such as the often shunned Man-Cutters and the Bone Clan, who make armour out of their kills. Legend tells that this is the place where the god Grimnir taught men how to smith and where great ritual magics used to be worked. Giant mountain horns that are blown to commence the gathering of the clans for war. At the High Moot, the great Jarls of Nordländ all sit side by side at this mighty table dressed in plain, coarse tunics and cloaks to represent that they all have one vote at the discussion and are equal in the arguments. The main trading town for the Mountain Holds, and the gateway to the Spear Peaks range.